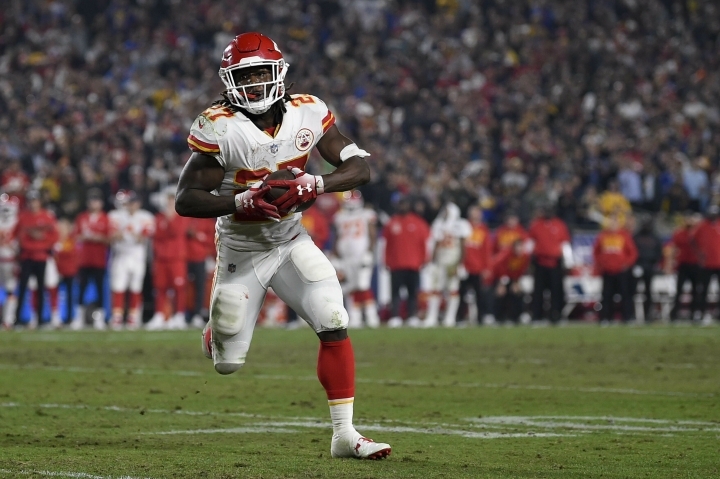 BEREA, Ohio — The lasting visual of Kareem Hunt's second NFL season wasn't him stiff-arming a linebacker, shedding a tackle or barreling over a cornerback at the goal line for a touchdown. The shocking signing came while the league continues to investigate Hunt's behavior in an incident that took place in a downtown hotel lobby last February. It came just weeks after Cleveland's turnaround season following a 0-16 calamity that resulted in the hiring of new coach Freddie Kitchens, whose appointment created more momentum for a franchise that has spent the last 20 years spinning its wheels. The Browns feel they're doing the right thing. Time will tell. Hunt remains on the commissioner's exempt list and could receive a significant suspension. That's enough for Dorsey, who said nothing is guaranteed and that he will have zero tolerance for further wrongdoings by Hunt. "You guys always hear me talk about men of character," he told reporters, who met with the GM in a conference room for 25 minutes not long after the team announced Hunt's signing. "I'll stand by that. I see a lot of men of character who commit egregious acts. But at the end of the day, they learn from those acts, moved forward and became better people. Again, I believe in second chances." Dorsey was adamant that the Browns completed a "thorough" investigation — the league's inquiry is still not complete — before signing Hunt and that owners Dee and Jimmy Haslam approved the decision to add another troubled player (see Johnny Manziel, Josh Gordon) to Cleveland's roster. However, Dorsey said the team's diligence did not include speaking with the woman seen on the tape. Later, standing in the lobby of the team's headquarters in front of a generic backdrop and not one that would typically feature one of the team's corporate sponsors, Dorsey was asked what his message would be to any female employees of the Browns. "I think we're all appalled by it. It is an egregious act," he said. "We all understand that. But after doing our research, extensive research, analyzing the situation, we came to the conclusion that, you know what, I am willing to help a man from a second chance moving forward to be a better person, and that's all you can ask for in society, and that's all I'm trying to do." "I would like to once again apologize for my actions last year," he said. "What I did was wrong and inexcusable. That is not the man I was raised to be, and I've learned a great deal from that experience and certainly should have been more truthful about it after the fact. ... I am committed to following the necessary steps to learn and to be a better and healthier person from this situation. "I also understand the expectations that the Browns have clearly laid out and that I have to earn my way back to the NFL. I'm a work in progress as a person, but I'm committed to taking advantage of the support systems that I have in place to become the best and healthier version of myself." Dorsey insisted the Browns didn't feel pressured to sign Hunt out of fear he would go to another team. Detroit Lions general manager Bob Quinn said the team evaluated Hunt and didn't feel comfortable trying to sign him because of numerous issues.